Pyramid Size: 25 x 25 cm. 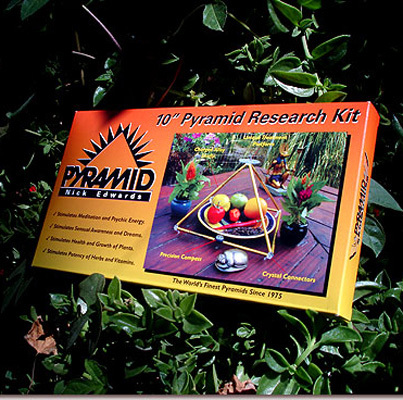 These precision made pyramid generators use advanced alloys and antenna design to collect and radiate high levels of PYRAMID ENERGY. The gold anodized aluminum alloy shafts are ENERGIZED with a one million volt Tesla coil to create constant high energy output. The pyramid shafts are held in the correct Cheops pyramid shape by unique jewel-like connectors. The open design allows objects to be placed in or out of the pyramid without disturbing its alignment. A special platform attaches to the top of the pyramid so you can place objects there for faster results. Each pyramid comes with a compass so you can align it to magnetic north.